Horse Prayers, Poems from the Prairie is available July 5th! The release of Horse Prayers, Poems from the Prairie, is happening in stages. The paperback will be available August 24 to all online sellers: Amazon, Barnes & Noble, etc, with pre-sale option very soon, the eBook is available now. The signed copies from me will be going out July 20th. It’s a collection of poetry from a small farm on the Colorado prairie; tiny stories in simple words, praise for the beautiful fragile land, and love poems to horses. This is a 106-page book of poetry and photography, a softcover mini-coffee table book. Some heartfelt, some humorous, these poems are a howl to the prairie wind. I’m a woman on a farm, wonderstruck by this simple life with its plain beauty; the comfort of daily chores and bittersweet sunsets. Even my words can’t look away. And the horses. This “gray mare” isn’t over that girlish phase. None of us are, so I write love poems to horses, putting words to this equine passion that powers a central part of our lives. What is it that pulls us so fiercely to horses? In the work I do as a trainer and clinician, I teach from the horse’s point of view; how he learns and responds, what he appreciates and what doesn’t work for him. I teach methods to connect in the most positive way for horses. These poems come from my side of things. Consider them a thank-you note for this astonishing life. Horse Prayers is available July 5th in print from Amazon, Barnes and Noble, Goodreads, and your local independent bookseller. The eBook edition is available from all online digital sellers, as well. As an independent publisher, it makes a huge difference when our books get reviews, so I ask the necessary favor. Please leave a review if you have a minute. It means more than you imagine… Please and thank you. Congratulations Anna! I have been waiting for more of your writings! So excited! I’ve put in my order and payment. I shall do a blog post review once i get the book and read it. Looking forward to it Anna! Thank you so much, Anne. I really appreciate it. Congratulations! You are a powerful poet, Anna. I’m looking forward to reading this book. Thanks, JD. Hope you like it. Hi, I’m wondering if your new book was a limited printing? I place an order with Barnes and Noble which was pending the July 5th release. Last week they cancelled my order saying the book was unavailable. If it was a limited release, will there be more in the future? I’m still old fashioned and like a real book that I can hold in my hands and have pages to turn. 🙂 Thanks much! I’m looking forward to reading, enjoying, savoring….. Thank you for asking, and yes, it’s coming! The printer mistakenly pulled it after it’s release and I couldn’t get them to right it. So now, it’s due out Aug. 24th, from a different printer. It looks great. Presale in a week or so, or you can order one from me now. 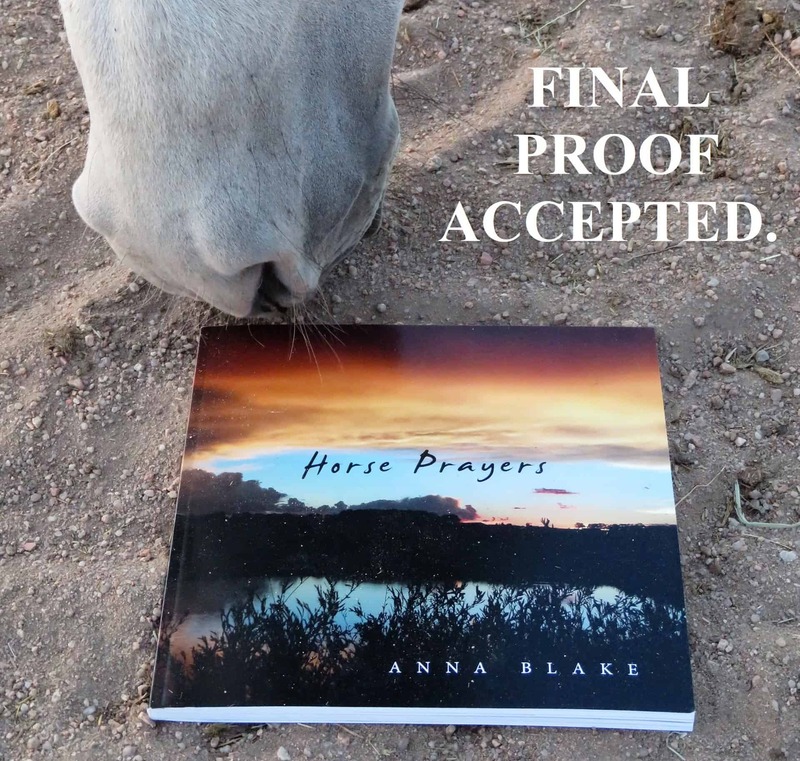 (https://annablake.com/new-horse-prayers-order-a-signed-copy/) Thanks so much for your patience, thanks for trying to track one down. It means a lot after this last few weeks of publication drama. Hope you like the book as much as I do, Lav. Thanks so much. Thanks, PPal came through. Book inscribed to you? Want a horse’s name, too? This one I’m ordering as a gift. I filled out the info on the webpage – hope it came through?? Got it, thanks. You’re just in time, I’ll add it to tomorrow’s mail. My total pleasure. Thanks for hunting it down!